Home » Blog » Volunteer opportunity spotlight: Docent this sound amazing? 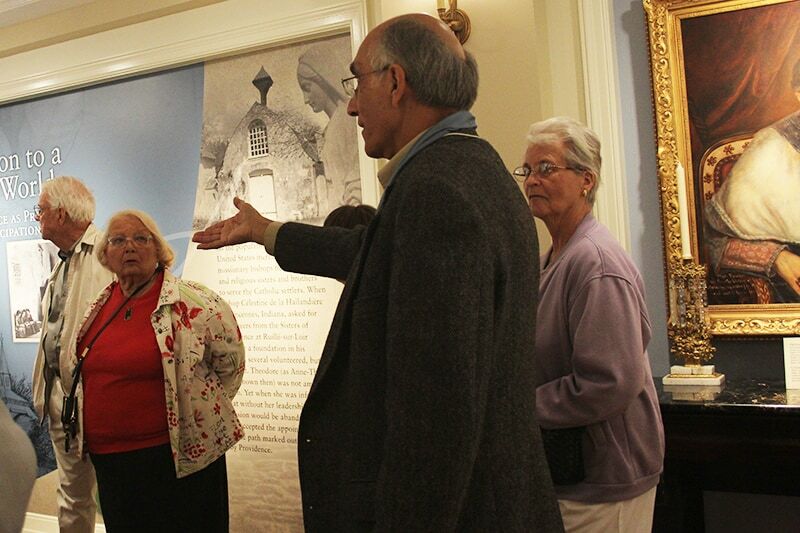 Docent Carl Bender leads a tour in the Shrine of Saint Mother Theodore Guerin. April is National Volunteer Month. Follow along each week as we highlight some of the opportunities the Sisters of Providence have available. Are you a person who loves details? Do you like to tell stories? Can you walk backwards and talk at the same time? If so perhaps being a docent is the right volunteer opportunity for you. A docent is a very important job here at Saint Mary-of-the-Woods. Each year we have thousands of people visit. They come to learn the story of Saint Mother Theodore Guerin and how this incredible place came to exist. And our docents are here to lead the charge. Being a docent is a vital volunteer ministry here at the Woods. We could not offer as many tours as we do without their help. Our docents share a strong commitment toward making known our beloved Saint of God, Saint Mother Theodore Guerin. Being a docent is a great way to keep both your mind and body active. You’ll need to be able to do a fair amount of walking and you’ll also have to learn and retain information about the Woods. But don’t let that part worry you too much. Sister Jan explains, “Docents will be trained but do not need to be proficient in all details; they are provided with talking points.” And remember that all of these tours will involve people, so you also should probably feel comfortable speaking in front of a group. If becoming a docent is something you are interested in pursuing, please contact Sister Rebecca Keller, our Sisters of Providence Volunteer Coordinator. She can give you all the details and answer all of your questions. Email her at rkeller@spsmw.org or call at 812-535-2878. I love being updated with what’s happening at the Woods, but I take particular delight in some of the humor that spews forth! Good one, Mary.